There are no silver bullets, but these five steps will help you separate the wheat from the chaff in this important industry. Investing checklists can help you in many ways. They make it easier to avoid obvious mistakes, help you stick to your convictions, and provide a starting point for narrowing the massive market down do a handful of serious investment ideas. Here are five important points to consider before buying a stock in the telecom industry. They are ordered from most to least important, to avoid wasting time on deeper analysis of a stock that struck out on an absolutely crucial requirement. 1. Does the business model make sense to you? This is easily the most important item on our list. Beyond a first pass/fail selector, the business model also becomes the lens through which you'll view the rest of this checklist. On the other hand, investors looking for stable dividend payers would reach the opposite conclusion. Verizon's dividend yield stands at 4.4% today, backed by $11.2 billion in trailing free cash flows. Ma Bell's 4.9% yield rests on annual cash flows of $15.9 billion. T-Mobile burned $1.3 billion of free cash over the last year, and doesn't pay a dividend at all. All three stocks may have a place in your portfolio. But you do have to set the rules right up top -- and the companies have to have a real strategy in place to reach the goals you're hoping for. Verizon is doubling down on its North American wireless network operations, having taken full control of that asset and selling off landline operations, AT&T looks for growth by acquisition, and is expanding into South America next. Do these plans make sense to you? Good, you can keep going. Otherwise, try another company. T-Mobile calls itself the uncarrier, hoping to attract millions of wireless subscribers by blazing its own trail. In Magenta's eyes, established business practices were made to be broken. That strategy has been effective so far, but also costly. Are you OK with burning cash to build a larger operating platform for the future? If so, T-Mobile will pass this first test. 2. Is the company growing fast enough? Again, the answers to this question must fit the expectations you set at the first point. Sure, T-Mobile is growing its revenues much faster than AT&T and Verizon. The Magenta network also grew its subscriber count from 33.3 million to 63.9 million over the same period -- a 90% increase. Meanwhile, Verizon boosted its subscriber count by 22% and Ma Bell's wireless business grew 20% larger. So T-Mobile is soaring on that nifty Un-carrier strategy -- but are the numbers adding up fast enough? Keep in mind that it's an expensive tactic, digging deep now to establish a large and stable platform for the long term. Along the way, T-Mobile has missed analyst targets on both the top and bottom lines many times. Is that good enough? As for Verizon and AT&T, their torrential revenue flows may grow slower but are much more predictable. Sometimes, that's all you're looking for. 3. Can the company handle its debt load? Make no mistake -- every serious telecom comes with a hefty debt package. T-Mobile's current debt stops at $29 billion. Accounting for cash and debt balances, the company's enterprise value stands 68% above the market cap. Verizon holds $110 billion of debt papers, and AT&T's debt adds up to $130 billion. Both of these giants sport enterprise values roughly 50% above their plain old market caps. There's no getting around some debt service when you're running a nationwide web of networking assets. This is true both for wireless and landline operations. To put these loans into perspective, Verizon spent 12% of its earnings before income and taxes on interest payments in its most recently reported quarter. For AT&T, that ratio ran up to 15%. T-Mobile's debt is smaller, but so are the incoming profits. In this case, the ratio stopped at a hair-raising 58%. That's another risk reading. If you're looking for stability, you need a low value here. For growth stocks like T-Mobile, a higher ratio may be acceptable -- but this step will give you a reminder of the go-for-broke stakes at this table. 4. Is management adapting to the changing telecom industry? Ten years ago, smartphones didn't exist. Ten years before that, it was all landlines, all the time. There's no telling what the telecom industry might look like in 2026, but you might want to make sure the company you're investing in is planning to be a part of that unknown future. AT&T seems intent on buying its way into whatever comes next, including a splashy entrance into the satellite TV market via DirecTV. Verizon doubled down on its own wireless network. Several nibbles at media subscriber markets have failed. It's unclear to me exactly how this company plans to stay relevant for the long haul. T-Mobile is more than happy to follow swings in the market, to the point of often setting the industry's course. From no-contract voice plans to reimbursed cancellation fees and rollover data, we've seen plenty of new wireless features making their debut at T-Mobile before the others majors eventually follow suit. So Big Red comes with a big, red flag here. AT&T's strategy may not be foolproof, but it shows a willingness to get things done. And T-Mobile passes this test with flying colors. 5. Is this stock worth the current price? Finally, none of this vetting matters if the stock is too expensive today. From some popular angles, T-Mobile will come out looking terribly expensive. Share prices have nearly tripled in three years, leaving P/E ratios at a pricey 24 times forward earnings. AT&T and Verizon hover around 13 on this metric. Stop there, and the giants of the industry will look like the obvious choice. But things change if you dig deeper. T-Mobile's enterprise value sits at 7 times trailing EBITDA earnings, nestled right between its two larger rivals. And taking expected growth into account, Verizon and AT&T are nursing PEG ratios north of 2.6 while T-Mobile's stops at 1.0. As a reminder, values near 1 should indicate fair value through the lens of expected 5-year growth prospects, and higher figures are worse. This brings us right back to square one. According to those PEG ratios, analysts generally agree that neither Verizon nor AT&T have earned their current price tags and should underperform the market over the next five years. T-Mobile, on the other hand, gets a passing grade. You may not agree with Wall Street's assumptions, but analyst reports are tailor-made for each stock and business model. You should take the list itself as a starting point, tweaking it to suit your own skills and needs. "One size fits all" isn't a thing in investment circles. But with these five points in hand, you're at least ready to take a deeper dive into the telecom sector. In this quick overview, I'd say that T-Mobile still looks like an interesting growth play. 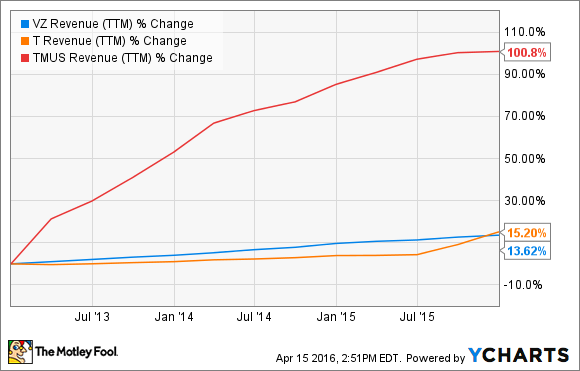 Verizon fell out on the fourth step, and AT&T's long-term value looks iffy in the end. Do you agree? Disagree? Share your thoughts in the comments below.